Should I say it again? Indonesian food FTW. Sorry, I may be biased, but really, it is amazing. If you haven't tried any Indo food, let me know and I'll happily introduce you to the wonders. Anyways, again, sorry for the irregular posts. I am working through the last year of uni (woo-hoo! ), part-time (sometimes 12-hr shifts) work, trying to get a new grad position at my dream hospital, as well as squeezing enough sleeping time, so blogging unfortunately has to take the back seat for a while. I don't even eat out as much as I used to, partly because I'm trying to save for exciting holiday trips, but also because I simply do not have the time. All of them reasons don't stop me from eating though. Oh no, they certainly don't. Let's go back to this post. For those who are still asking, no, I am not in Jakarta anymore. I am back in Sydney and missing Indonesian food heaps. One of them is the lemper. You may be familiar with the name as I have mentioned it a few times, I even brought the un-grilled version of it to Sydney Food Bloggers Picnic last year. 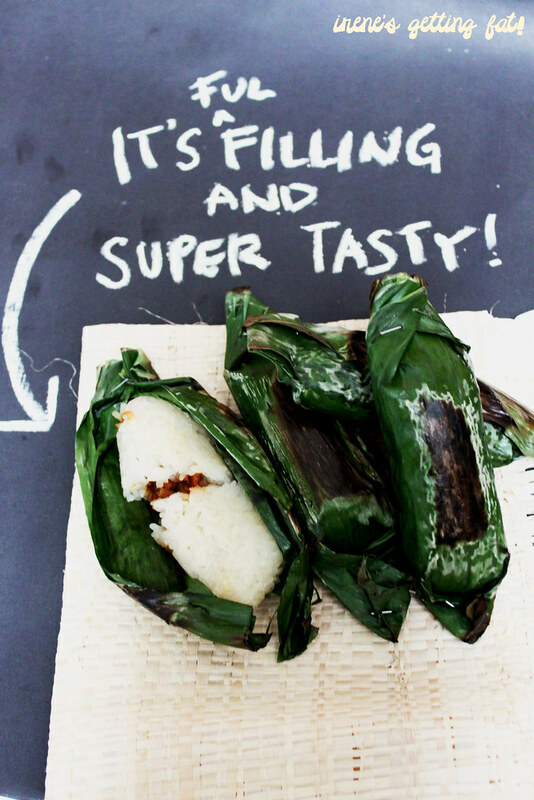 To refresh your memory, it's sticky rice filled with various filling, wrapped in banana leaves, served either grilled or un-grilled. 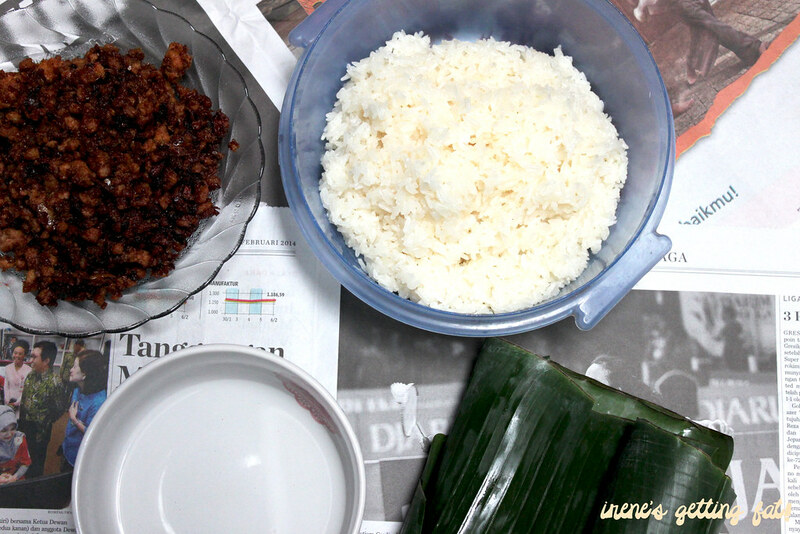 Some have asked me about the recipe, so one day during my holiday in Jakarta, I persuaded the mother to make some and write the recipe down. Mind you, the recipe is mostly based on her intuition and gut instinct, we didn't exactly measure every ingredients on a scale. Oh, we made our sticky rice with the rice cooker, but you can also steam it. Here's how to steam it, but using rice cooker is much easier for us. Do the rice first because it takes longer time! 1. Wash the sticky rice until clean, drain the water. 2. Put them into rice cooker, add water and salt. Turn on the rice cooker. 3. Wait for about 15 - 20 minutes, then take the sticky rice out. 4. Add coconut milk onto the sticky rice, mix thoroughly. Set aside. 1. Chop garlic finely, then mix with dried shrimp. 2. Heat some oil onto the wok/pan, then add the garlic mixture, fry lightly until fragrant. 3. Add minced pork, sweet soy sauce, salt and pepper. 4. Stir them finely, cook until through. 1. Get a bowl of warm water to wash your hands from the stickiness. Believe me, you'll want this. 2. 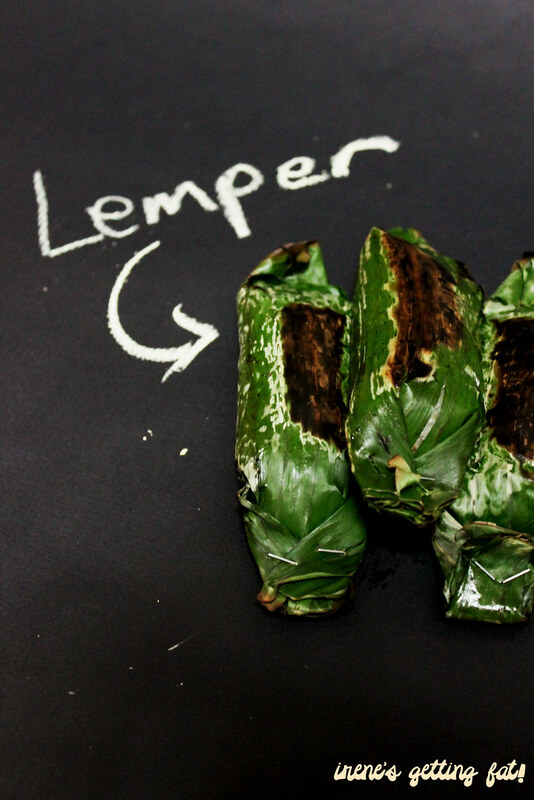 It doesn't matter how big your banana leaves are, you can make these lemper as big or as small as you want. My ideal size of the banana leaf is about 20 cm x 20 cm big. 3. 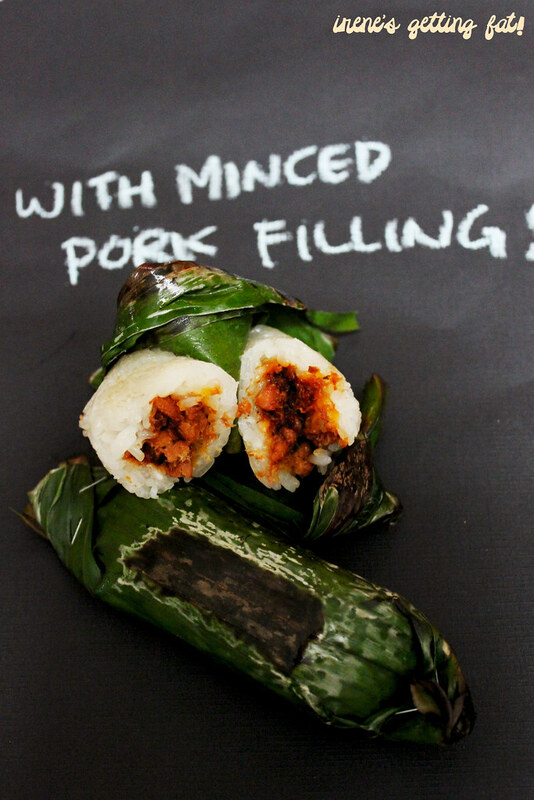 To start, get some sticky rice and flatten them on the banana leaf. Add some of the pork mixture, but don't go overboard because you don't want to overstuff it. 4. 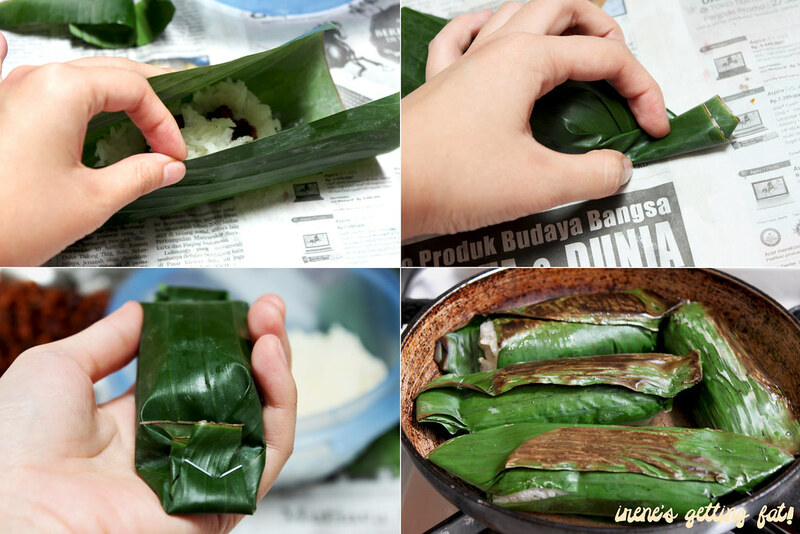 Roll the leaf so it covers the whole log of sticky rice, leaving some space on both edges. Fold one edge diagonally, overlapping each side, then use a stapler to secure the fold. Repeat for the other edge. 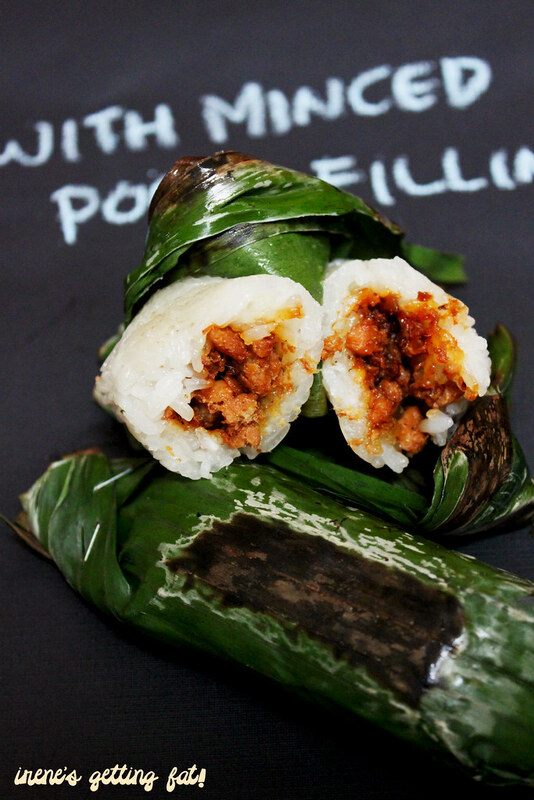 You can push around and tidy up the sticky rice inside with a spoon before folding the edge to make it firmer. 5. 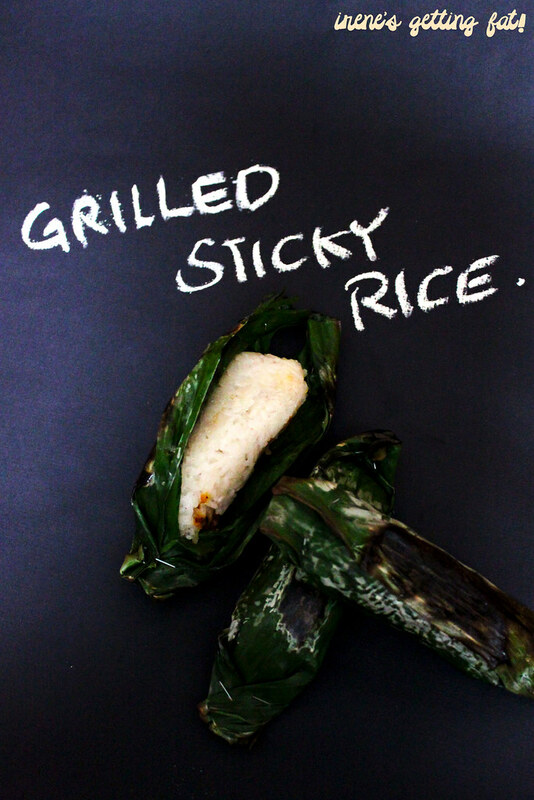 Grill the wrapped sticky rice logs on a pan that has been squirted lightly with oil. Grill them on both sides for about 3 - 5 minutes each depending on the heat. We want a dark brown side with wilted banana leaf. This is the fist time I am actually writing an original recipe, so pardon if the language is confusing. I need more practice, obviously. I made the pics so that they'll be self-explanatory. Heh. But basically, grilling them help getting the fragrance out, and the process results in slightly crunchy, smoky sides. The un-grilled version is also amazing, but grilling them is kinda like putting them on steroids. I really don't mind any filling stuffed in, but so far, this aromatic pork minced spiked with dried shrimp still sits on the throne of my heart. I can easily down a few number of them, either for a snack or even a meal, but really, they can stuff you easily indeed. Maybe I should bring another bowl to the next picnic? ;) Thanks, Helen! My mother used to cook it for me and weekends. Really it is very tasty.